Click on the links below to find a participating ATM near you! Twenty Nine banks have joined together to form the FREEDOM ATM ALLIANCE. The goal of the Alliance is to provide surcharge-free ATM alternatives to our customers. Banks entering the Alliance agree not to surcharge the customers of any other Alliance member at their ATMs. With your bank as a FREEDOM ATM ALLIANCE member, you gain a surcharge-free ATM network offering more than 670 ATMs! 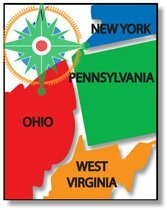 The Alliance reaches over 50 counties, extending north into New York, south into Maryland and west into Ohio, with a majority of the ATMs located in southwestern Pennsylvania. Stop by your branch office to pick up a FREEDOM ATM ALLIANCE Directory today or use the links below to locate the nearest ATM. Copyright © 2019 , FREEDOM ATM ALLIANCE.